Well it's day 4 of our new lives in Dubai. And again I'm stuck to know which photo to post. Do I post a picture of the farewell at the airport? The guest house we spent our last week in South Africa in? The dog and the cat in their crates to the airport? The hotel in Dubai where we stay until our container arrives or even our new home? The picture of the dog and cat arriving safely? Too many choices. My rule though is that I post a picture taken on the Sunday and as today is the first time I have had the opportunity to go exploring on my own with Bob as hubby is at work (Sunday is a working day, the start of the week) I thought I'd show you a picture of the Burg Al Arab, the most expensive hotel in Dubai, if not the world. 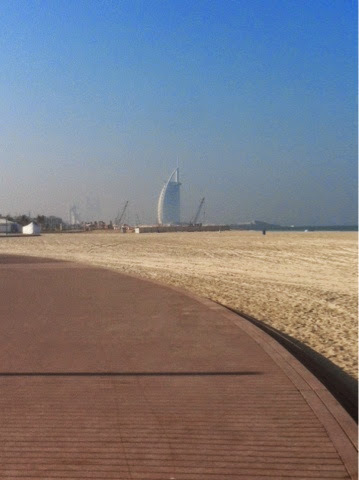 Bob and I walked for 10 minutes zig zagging through the streets till we hit the beach. Unfortunately dogs aren't allowed on the beach, but I suspect Bob and I will be making regular visits to walk along the prom. Wow, must have been a fantastic sight! I really hope you enjoy your new life in Dubai. Good for you, you've arrived. I've been following your departure from South Africa. Well done! Here's to your new beginning in Dubai. Poor Bob, he likes the beach. Are dogs a common pet in Dubai? Wow, what a stunning view, I'm sure it'll take a while to get used to. Have you checked out Dubai bloggers? Could be interesting reading matter, or even people to meet up with. I follow one called Circles in the Sand.